On our honeymoon, almost exactly two years ago today, we arrived in the fair city of Verona thoroughly pissed off. And then things got worse. It wasn’t as if the day had started badly either: waking in Bologna; leisurely sipping a doppio espresso; before strolling along Via Pescherie Vecchie to buy a small, crusty loaf, a giant, but sweet tomato, an immoderately-sized leaf-wrapped burrata, and a serrated knife; then, wandering into the Piazza Cavour to make ourselves nearly sick with buttery cream cheese curds washed down with a half-bottle of bardolino. All in all, a pretty reasonable opening gambit. I don’t even recall at what point things began to go west, but the supposed simple hour and a half drive between the two cities took us more like four. So, in late afternoon, we lurched into Verona hot, tired, stiff, and needing to pee. And then we couldn’t find our hotel. Another hour of angrily trawling the Veronese streets in our banana-hued rental car, grinding gears, and now with excrutiating pee pains, we finally found it – closed. No amount of banging on the door, honking of the horn or screaming at the windows produced a response. Despairing, I relieved myself copiously in the hotel’s flower bed and, looking up with an air of contentment, spied a large pink elephant beaming at me from across a field. Salvation arrives in many guises, and drawn towards it, things immediately improved. With a free bottle of valpolicella, a purring welcome from a friendly ginger tom, a pair of iridescent peacocks puttering outside, and a room for the night with breakfast, Hotel Elefante saved us from sleeping in our car and, perhaps, from premature marital counselling. 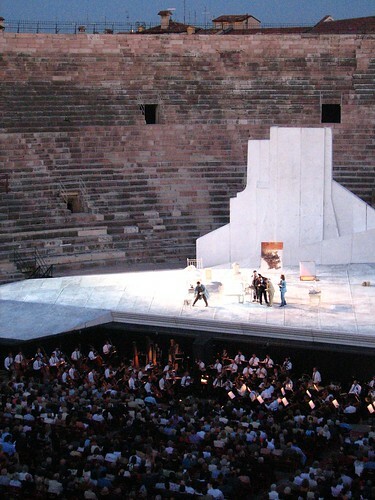 Having regained at least partial equilibrium, we made for the city center dressed for the theatre. Skirting the wholly-invented balcony of the wholly-invented Capulet family, we ducked down Via Portici and into a restaurant filled with lovers pawing each other under the table and, like cartoon dogs, sucking-up the same strand of spaghetti. Still too flustered to entertain any romantic notions, we ordered what turned out to be a vast portion of fegato di vitello alla Veneziana or Venetian-style calves’ liver, which, with its heady richness of garlic, sage and cream, would have rendered senseless even the most amorous couple. 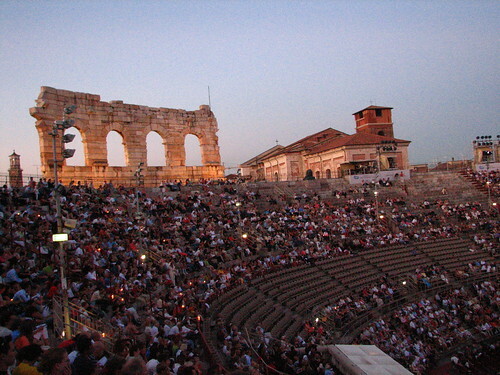 Things continued to improve after dinner as we shuffled onwards to the arena di Verona and, cooling our tails on its ancient bleached limestone blocks, watched an epic performance of Puccini’s La Bôheme that somehow provided much-needed perspective on the day’s minor tragedies. Periodically, we’ll laugh (or grimace) at our haplessness that day, but as time passes, we’re more apt to remember the liver than the liverishness. During a recent lunch at the very respectable Aperitivo here in Park Slope, Brooklyn, we ate a delicious adaptation of that dish over linguine with a nice dry Valpolicella that was reminiscent of our pre-opera meal in Verona. Here it is, recreated for your visual pleasure. Feel free to eat it on a balcony or at a banquet for quarreling clans, just don’t expect to be feeling frisky afterwards. Chop liver into small-bite-sized chunks and sprinkle with salt and pepper. Melt butter in saute pan over medium heat and cook liver gently for 3-4 minutes, or until lightly browned on all sides. Add garlic and shallots to pan and saute for another 3-4 minutes, but do not allow to color. Add all but a teaspoon of the sage. Turn heat to medium high, and hit pan with white wine. Allow wine to reduce by half before adding the cream. Reduce heat to medium-low, and simmer for another 4 minutes. Cook fresh pasta in a lot of boiling salted water until al dente, no more than 4 minutes. Sauce should now be smooth and about half what it was. Add peas and stir well. Mix al dente tagliatelle with sauce in saucepan, making sure pasta is well coated with sauce but not swimming in it. Kill heat and sprinkle with grated grana padano or parmigiano reggiano and remaining julienned sage. 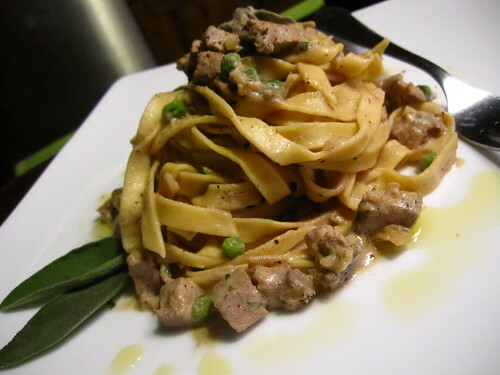 I’d love this dish, but how to get my husband and daughter to eat veal liver? What might one substitute? hmmm. that’s tough. 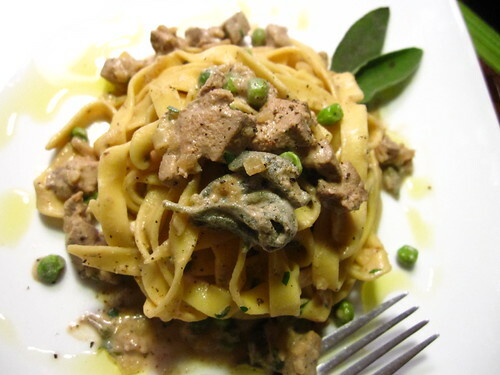 part of what makes this dish so special and good (to us, at least) is the use of veal liver. but, i guess you could substitute anything else for it – it would change the dish, but keep the creamy/sagey-ness. The sauce is really completed with the addition of the liver (b/c it breaks down very easily) so leaving it out would make it just a pasta with sage cream sauce dish – which, i’m sure, would be good in itself. You could add portabello mushrooms, maybe pieces of sausage. get creative! but a true substitute, there really isn’t one. What a wonderful, pee-filled post! Ha. Was your whole honeymoon in Italy? We’re thinking of doing it there—any advice? yeah, we were married in tuscany and spent a week there for the wedding and then had another 2 1/2 weeks all over the north of italy including elba island (HIGHLY recommended). i’ll email you separately about this but just take 1 good piece of advice – DO NOT TRY AND DO TOO MUCH. just pick a few places or one place to really explore. it’s hard b/c you have so much to see and so little time but in italy, do as the italians do and take it slow. i’ll email you..
What a day you had. I love the pictures that you had posted. Beautiful photos, and what a marvelous pasta! liver, mmm… liver is relatively goreign to me but recently I made a chicken liver pate. Surprisingly pleasing. Haha, loved this post. 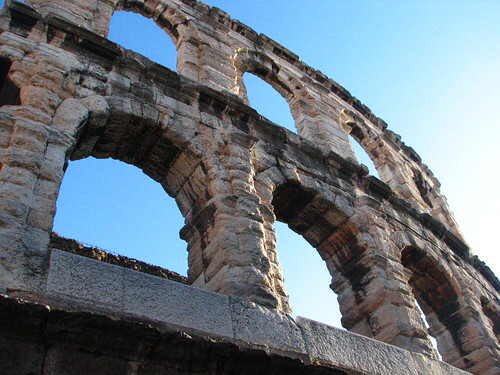 I was in Verona last summer, beauuutiful place for a honeymoon, wonderful food and also in our case, terrible hot weather, we were close to fainting while visiting the Arena. Post title made me LOL though Jonny’s ‘relief’ made me cringe. I sympathize, but TMI? 🙂 Usual wit and good photos and a very interesting pasta recipe. I thought I’d eaten every possible pasta combination, but not this one. The recipe as presented looks so delicious that I’m anxious to try it. That sounds like a typical Seponara/Sills vacation situation! especially the peeing on a bed of flowers part!! Is the theater in the picture the one you guys really went to? that looks AMAZING…what it must be like to be able to live in Italy – i hope to know before i die!! oh, the food looks ok too! ha kidding! Love the snippets of your trip to Italy. I’m thinking I’d go back anywhere I could get free bottles of valpolicella… one of my favs. Looks like you had a fantastic time in Verona. I want to go there too:) Thanks for the recipes. well– you DO know that Romeo and Juliet also couldnt find a place to stay in Verona — hence their stay alll night talking on that balcony–However that pasta look\s deelish!!! Make it for me!!! go rosie! nice one… you are very right! we will totally make it for you. it’s very easy and very cheap and i wouldn’t mind in the least making a cheap and easy meal for you, my dear mother. LOL! love ya! Always such great anecdotes. You really live and eat well. Just want to know why Joan assumes it was Jonny peeing in the bushes? Gee, i never ever thought of liver pasta, why not? Great post. that is something that really bonds a couple. Your post was funny. Bob spent his childhood avoiding the liver his mother would try to disguise in various dishes. Don’t know if I’d be able to get it past him, so I’ll just have to have it in a restaurant some time, somewhere. I have to come to love liver esp in rich creamy dishes like this. PPL need to open their taste buds to this. On a flower bed you say? LOL. The pasta looks delicious! My father would love this dish. He seldom eats pasta, because we have never prepared pasta with a liver sauce — which, apparently, is the end-all and be-all of pasta for him. I have never been to verona -. Yes, I know so near yet so far. did i say this looks delicious. Sounds like you had quite an ordeal that day, but isn’t it the trials that make trips more memorable? Liver is one of my least favourite foods (bordering on unpalatable) for me, but I’d be inclined to give this a try if someone put it down in front of me. ← Lettuce Convince You – Butter Lettuce Soup is Good!